Slash was recently interviewed by Aftonbladet TV, you can read some excerpts below. Slash talked of his restored relationship with Axl Rose: "It was probably way overdue, you know. But it's…. you know, it's very cool at this point. You know, let some of that, sort of, negative… dispel some of that negative stuff that was going on for so long." 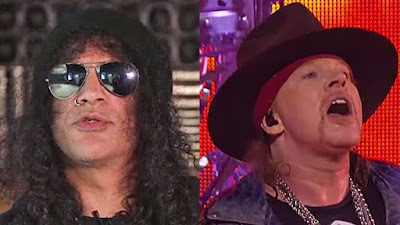 About if his warmer relationship with Axl will lead to a reunion of Guns N' Roses' classic lineup, Slash said: "Oh, I couldn't answer that one, though…" Pressed on why that is, Slash replied: "All right, let's get off the subject, 'cause, you know, that's an old one."